can anyone tell me why my recordings via Overbridge in Ableton Live are way too quiet? I also noticed that my Analog Rytm MKII is too quiet when using Overbridge 2 and Live 10.
yes I’ve heard that, but the volume is really too many times too low. I can not use Overbridge like that. Do you mean when monitoring back on the DT? You can boost the return signal to the DT in System -> USB Config -> USB To Main (DB). 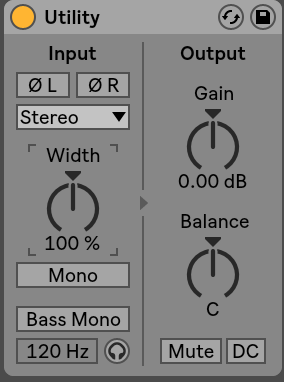 It defaults to 0, but you can set it up to +18 (if I remember correctly)…for me that gets the return signal from Ableton at about where it normally is when I’m not using OB. i know, thnaks. but that did not help. I would open a ticket with Elektron then…sounds like it may be a problem with your machine. I have been monitoring back through my DT from Ableton and it sounds fine, plenty of loudness. Each track is supposed to come in at -12db. If they come in at around -12db then that is normall. I use utility plugins a lot for this. For example I will boost a signal by 12db to go loudly through an overdrive and then use another utility after that to lower the volume until it hits -12db again. This type of gain staging is good practice. This happens with my digitakt + overbridge + ableton also, the individual inputs volume are extremely low. For example I have a kick full sample and track volume at digitakt, and in ableton is -20db. Only if I turn the overdrive to top it gives me -12. I think that is not right. Hope someone can help! Hi Guys, same Problem here. Using Reaper and i have -22db. When i turn the Overdrive all up i get -14db. Is that normal? Seams very quiet to me. Is there a Solution so far? I just acquired a 828ES as my first interface / standalone mixer. Do you use yours in combination with Overbridge? Also I had issues while connecting my gear using balanced cables. A4 and AR MKII in my case: Extremly low level on right output of each stereo pair (signal cancellation or something similar). Had to switch run everything using TS cable to solve the problem. No Overbridge in use. Just pluged every synth into the 828es using TRS cables. So far I have only recorded the Analog Keys and the A4MKII without any problems. But maybe I should also try TS cables to test the difference… ? Do you mean the right output from your 828es interface? Yes. In the beginning I thought that my 828 interface was broken or something. I tried lots of different combinations such as AR into 1/2, A4 into 3/4 and vis versa. Never achieved to get both left and right channels to work on all my Elektron Analog machines.